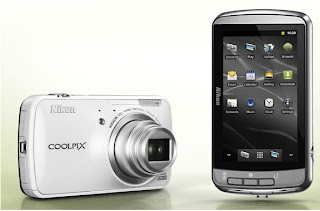 Nikon has shortened the gap between camera phone and our digital point and shoot cameras. Coming in September, the $350 Coolpix S800c will now have access to the Android market. No cellular access, but WiFi is included. If no WiFi is available just tether it to your smartphone or tablet! Now, you’ll be able to take photos with your higher quality digital camera and upload them straight to your favorite social media site. In addition, the camera also has access to regular smartphone apps like email, internet, games, etc. The camera is complete with a 3.5-inch touchscreen display, 10X zoom, 1080p video capability, includes GPS and maps for tagging images with locations, and is running Android 2.3 (Gingerbread). Just about the only thing this camera is missing is the ability to make phone calls!